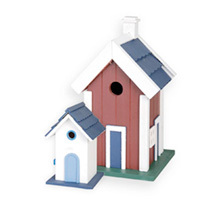 Colourful shaker style bird house. Hinged door to allow for cleaning and a fitting to hang. 18 x 17 x 27.5cm. Assorted colours/designs.